The STRAINPRESS® is a horizontal pipe-shaped coarse material separator which consists of inlet and driving zone, screening and press zone and finally a discharge section with a conical pressure regulating device. The coarse material is separated continuously under pressure and periodical cleaning of the screening zone by backwashing is not required. Reduces plant operation and maintenance costs and increases the operating reliability of downstream sludge treatment systems, such as thickening, digestion, dewatering, hygienisation, drying, etc. The STRAINPRESS® system can be integrated in a closed pipeline system. Screening, dewatering and transport of the coarse material in one operation. 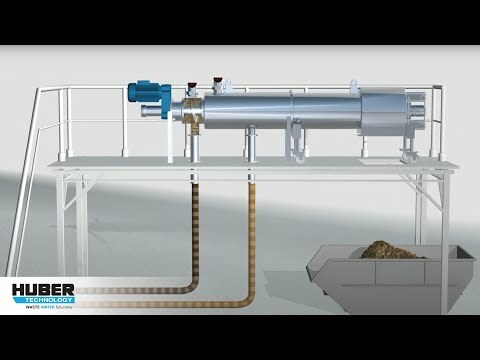 No second pump is required for the screened sludge owing to the closed and compact in-line system. Washing off sludge or backwashing is not necessary. The horizontally moveable screw can be re-adjusted to ensure continuously perfect screen cleaning. Fully-automatic continuous or intermittent operation. Little space required, easy subsequent installation into the pipeline. The automatic pressure requlating conus ensures uniform dewatering even with strongly varying coarse material quality and concentration. When handling sludges with heavily varying DS and coarse material content, the pressing screw starts to work in dependence of the operating pressure (filter cake resistance).